Aric Almirola started Stage 1 in the 29th position at the 1.5-mile track and ended it in the 15th spot. On lap 31, Almirola was the biggest mover of the race after gaining 12 position since the drop of the green flag. The Tampa, Florida native entered the top-15 on lap 36. Almirola made a scheduled green-flag pit stop on lap 39 for fuel, four tires and adjustments to help with a loose condition. All four of the SHR entries completed Stage 1 in the top-15. The 33-year-old began Stage 2 from the 14th spot and ended the stage 13th. Before the start of Stage 2, Almirola visited pit road for four fresh tires, fuel and adjustments and gained one position. The No. 10 machine visited pit road for a scheduled green-flag pit stop on lap 123 and Almirola received fuel, four tires and adjustments to help with his loose in and off, and tight-center condition. On lap 136, crew chief Johnny Klausmeier informed Almirola that he was running top-five lap times in the Smithfield Ford Fusion. Almirola entered the final stage in the 13th position and completed it in 10th. Before the green flag dropped on the last stage, Almirola once again visited pit road for fuel and four tires. Almirola reached the top-10 in the No. 10 Ford Fusion just as the caution came out on lap 176. During the caution Almirola relayed to the crew that the car’s handling was the closest it had been all day to the start of the race. With less than 50 laps remaining, Almirola was running in the ninth position – his highest spot all day. On lap 223, Almirola made his final pit stop of the day for four fresh tires. 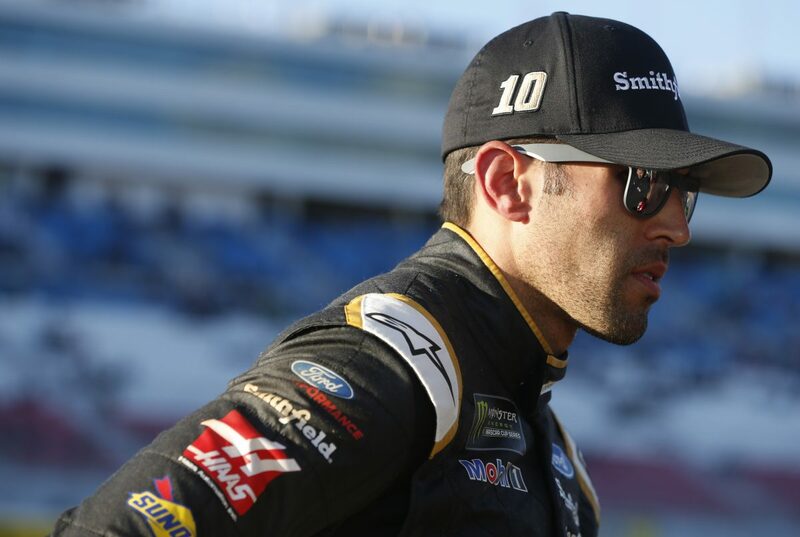 Almirola was able to hold on to the 10th position to earn his first top-10 since the November 2017 race at ISM Raceway located near Phoenix, Arizona. Almirola scored his first top-10 finish in 10 career NASCAR Cup Series starts at Las Vegas. This was Almirola’s first top-10 of 2018. Harvick’s victory in the Las Vegas 400 marked the 45th overall win for Stewart-Haas Racing (SHR). It was the organization’s 41st points-paying Monster Energy NASCAR Cup Series win and its third at Las Vegas. This was SHR’s second straight Cup Series victory. Harvick won last Sunday at Atlanta Motor Speedway. This was SHR’s fifth Cup Series victory with Ford. The team won its first race with Ford when Kurt Busch captured the 2017 Daytona 500. This was Harvick’s 16th Cup Series victory since joining SHR in 2014. His margin of victory over second-place Kyle Busch was 2.906 seconds. It marks his second series win of 2018, his second at Las Vegas and the 39th of his Cup career. There were four caution periods for a total of 29 laps. Nine of the 37 drivers in the Las Vegas 400 finished on the lead lap. The next event on the Monster Energy NASCAR Cup Series schedule is the TicketGuardian 500k on Sunday, March 11 at ISM Raceway. The race starts at 3:30 p.m. EDT with live coverage provided by FOX, MRN and SiriusXM radio Channel 90.